Design and technology is about providing opportunities for students to develop their capability, combining their designing and making skills with knowledge and understanding in order to create quality products. 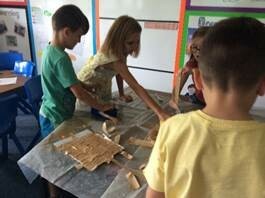 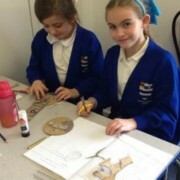 In Design and Technology, children acquire and apply knowledge and understanding of materials and components, mechanisms and control systems, structures, existing products, quality and health and safety. 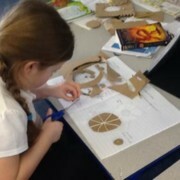 Skills learned in design technology help with learning across the curriculum. 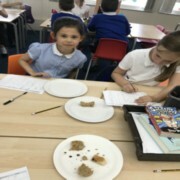 Their knowledge about the properties of materials helps in science and the practice of measuring accurately helps in maths. 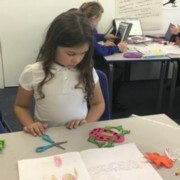 These skills help in IT through the children’s use of computer control and, naturally, in art and design. 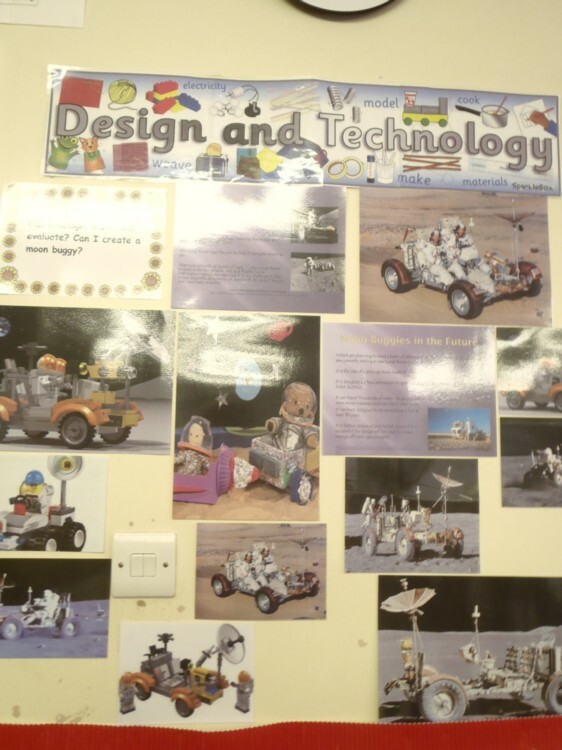 Design and Technology education helps develop children’s skills and knowledge in design, materials, structures, mechanisms and electrical control. 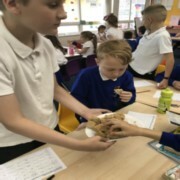 They are encouraged to be creative and innovative, and are actively encouraged to think about important issues such as sustainability and enterprise. 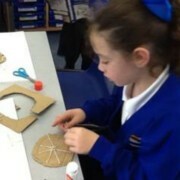 D&T is often one of a child’s favourite subjects. 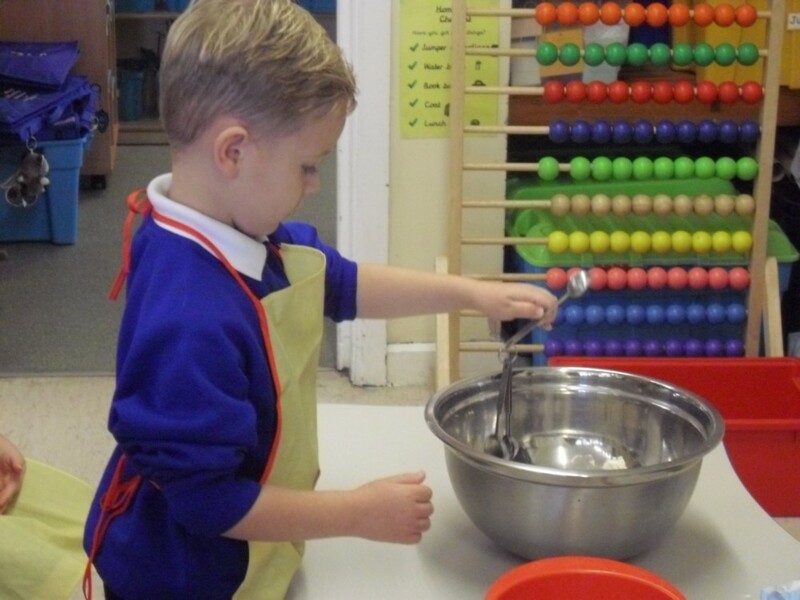 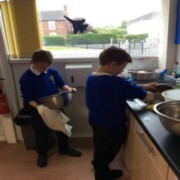 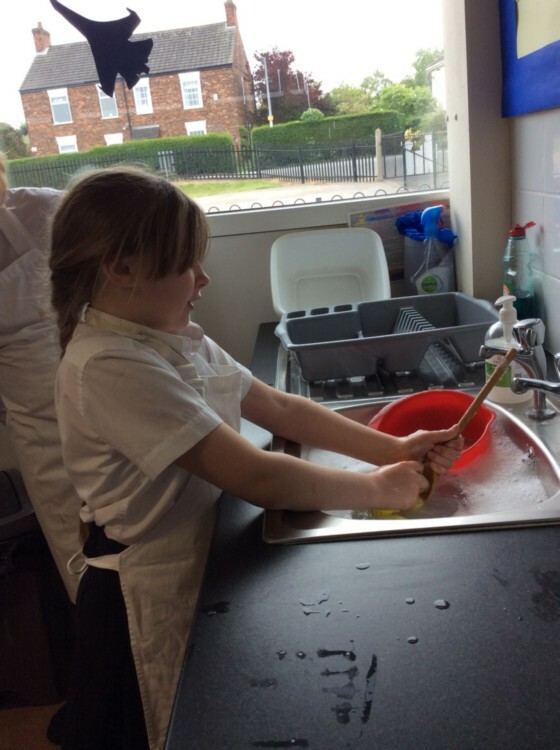 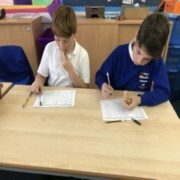 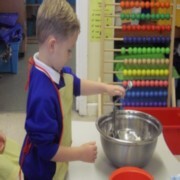 Children like making decisions for themselves and doing practical work. 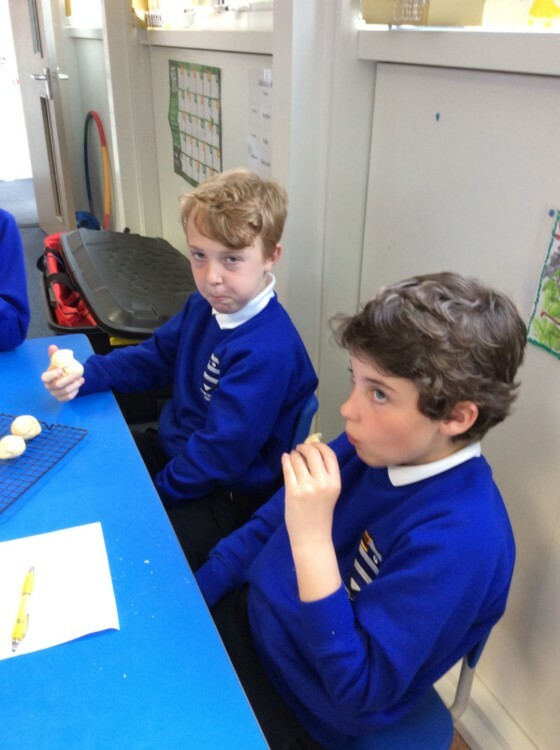 They love creating products they can see, touch - and even taste - for themselves. They feel proud to have done so. 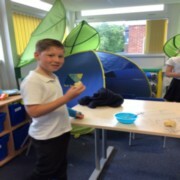 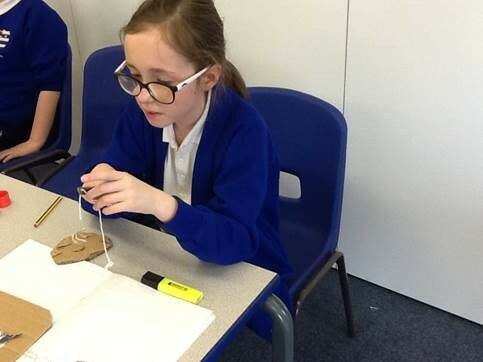 D&T brings learning to life. 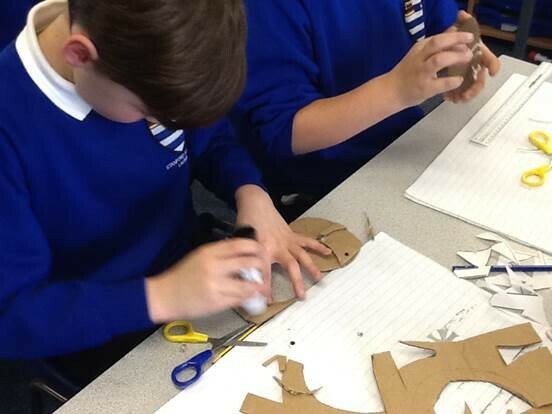 It is a motivating context for discovering literacy, mathematics, science, art, PSHE and ICT. 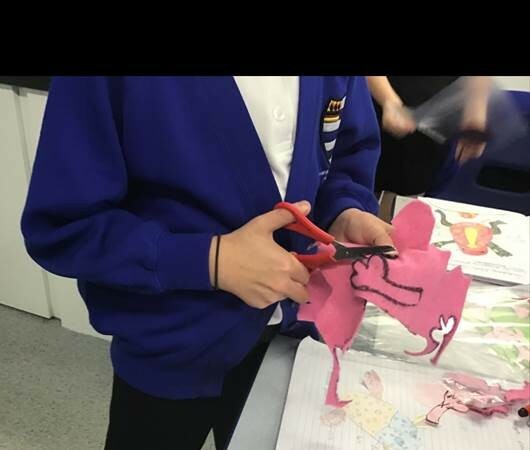 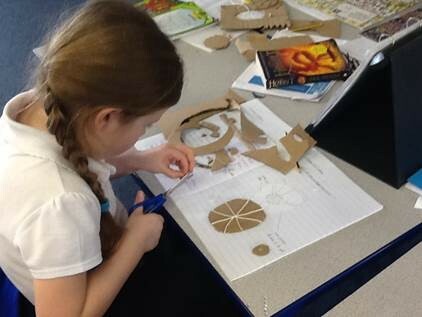 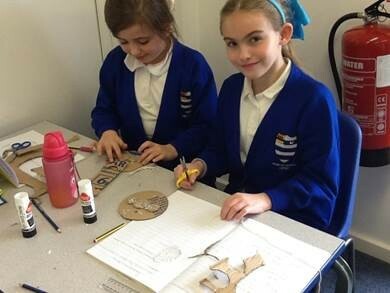 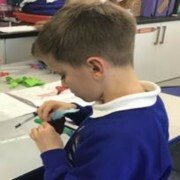 Primary D&T also provides a firm basis for later learning in the subject and a platform for developing skills in literacy and numeracy. 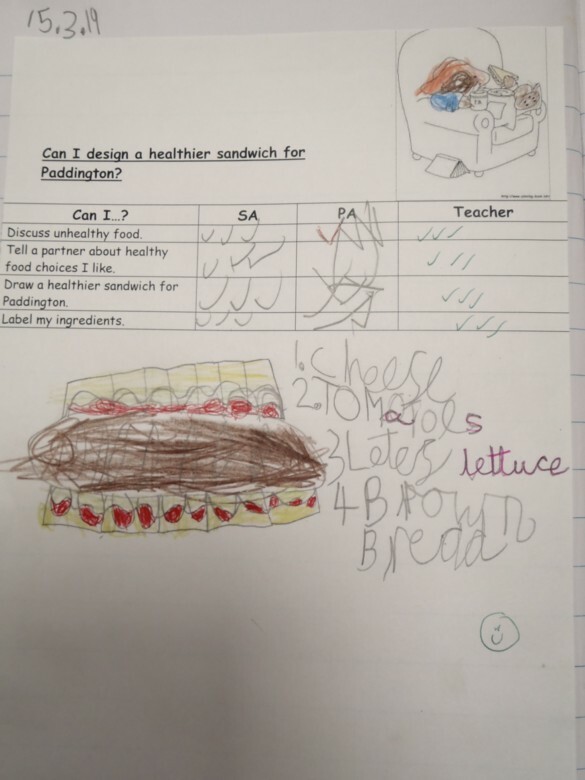 Can I design and make a healthier sandwich for Paddington Bear? 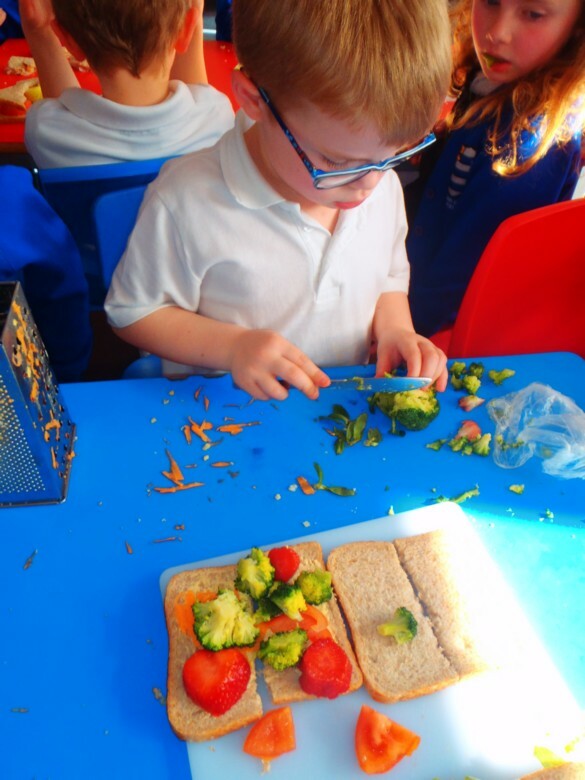 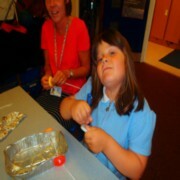 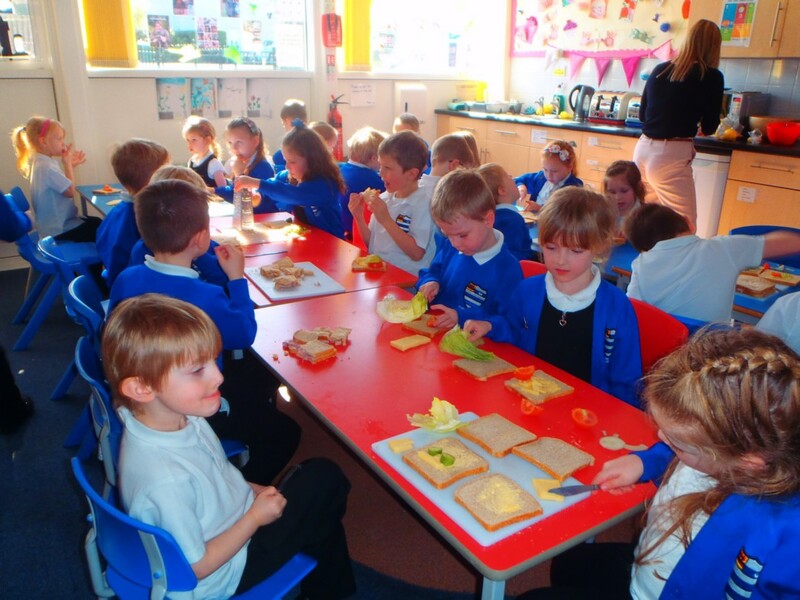 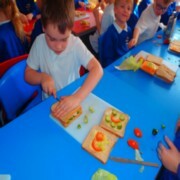 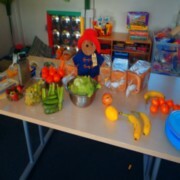 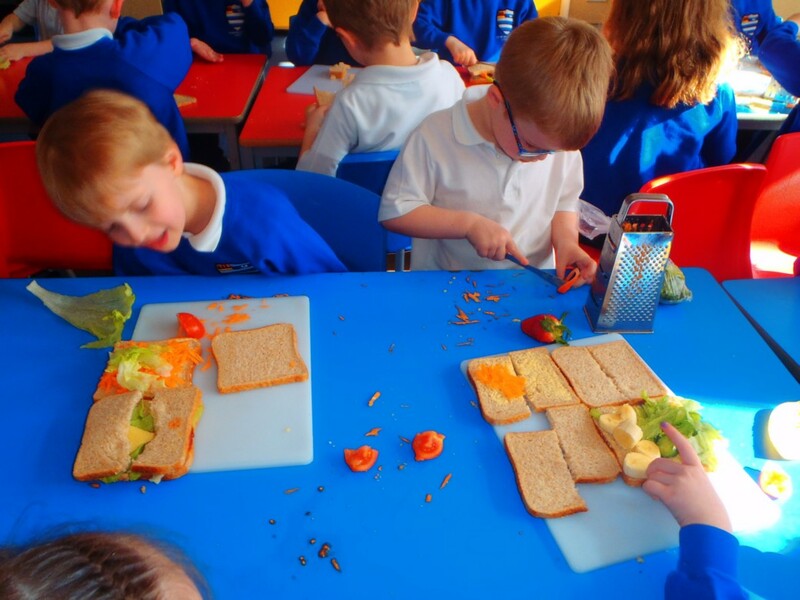 The Sunflowers have had great fun creating some very delicious and healthy sandwiches for Paddington. LS- My sandwich has lots of tasty ingredients. 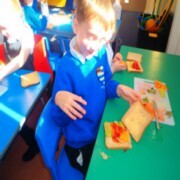 AM- I enjoyed tasting the ham and bread. 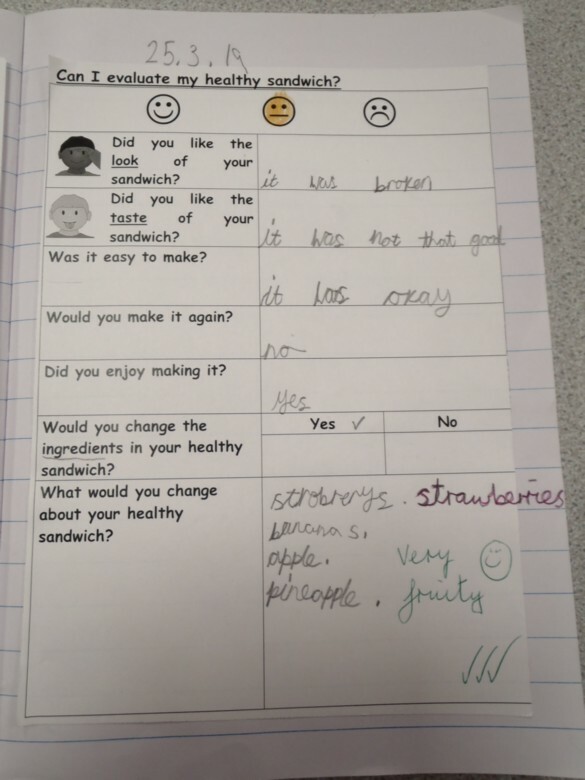 HE- The cucumber and had made a good taste together. 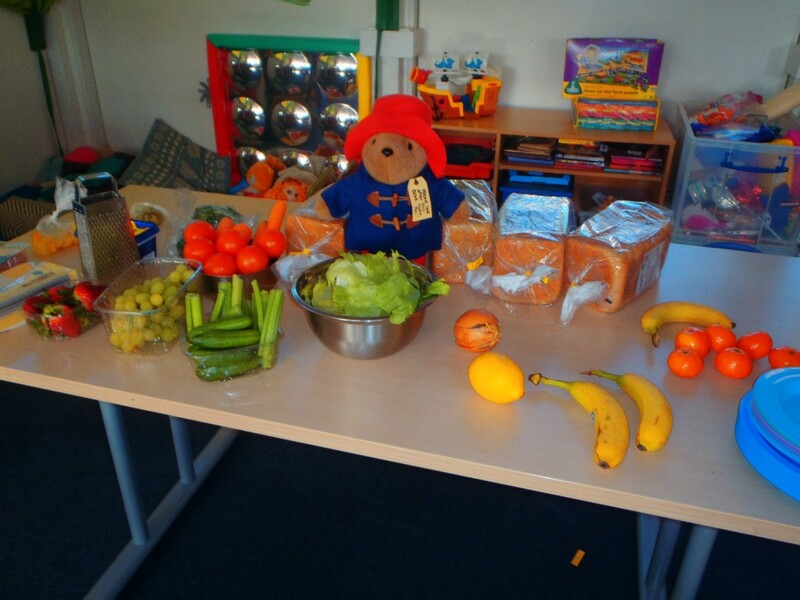 MT- I didn't like the lettuce, but everything else was tasty. 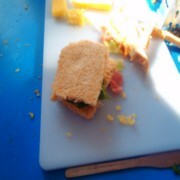 TB- My sandwich got all messed up because I put too much salad in it. BJ- I tried some different things in my sandwich, like broccoli. Can I learn the technique of weaving? 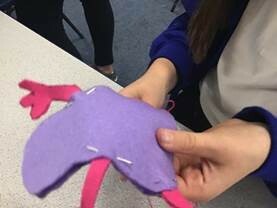 Can I learn the technique of sewing? 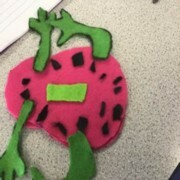 Can I evaluate my finished product? 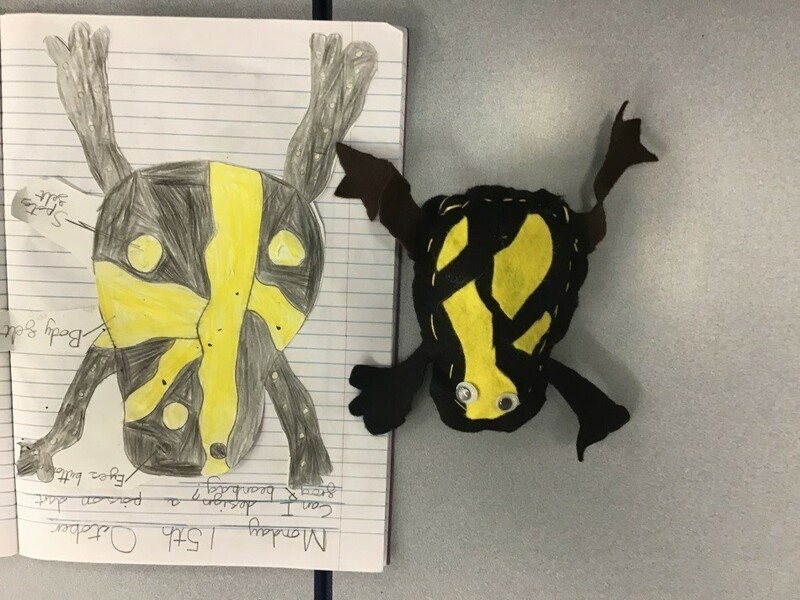 Can I design and make a poison dart frog? 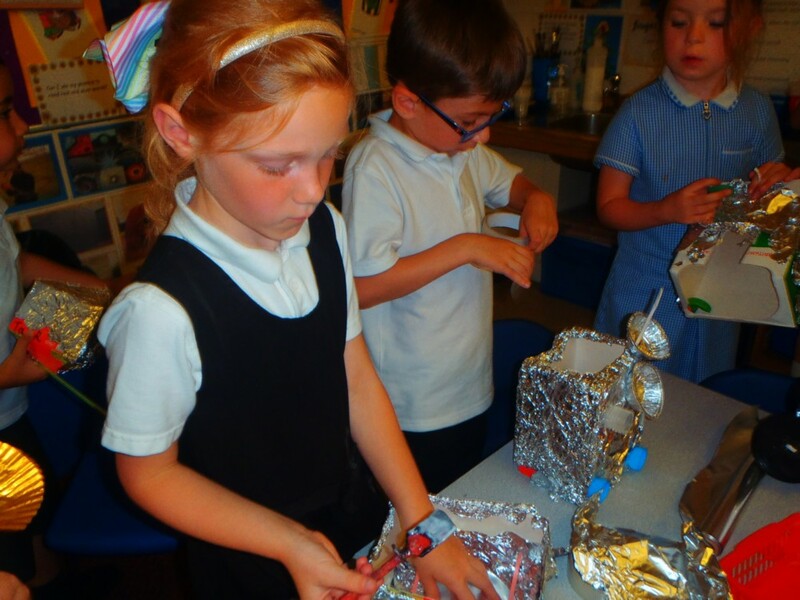 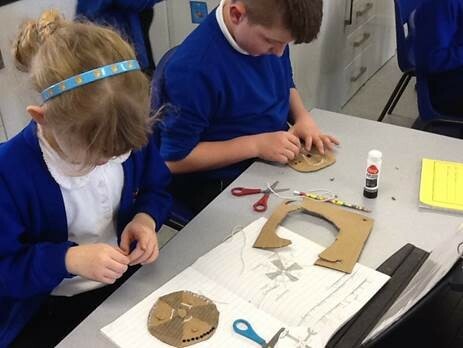 Can I join materials together and handle tools safely to create a bell decoration? 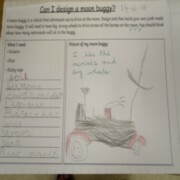 Can I design and make a moon buggy? 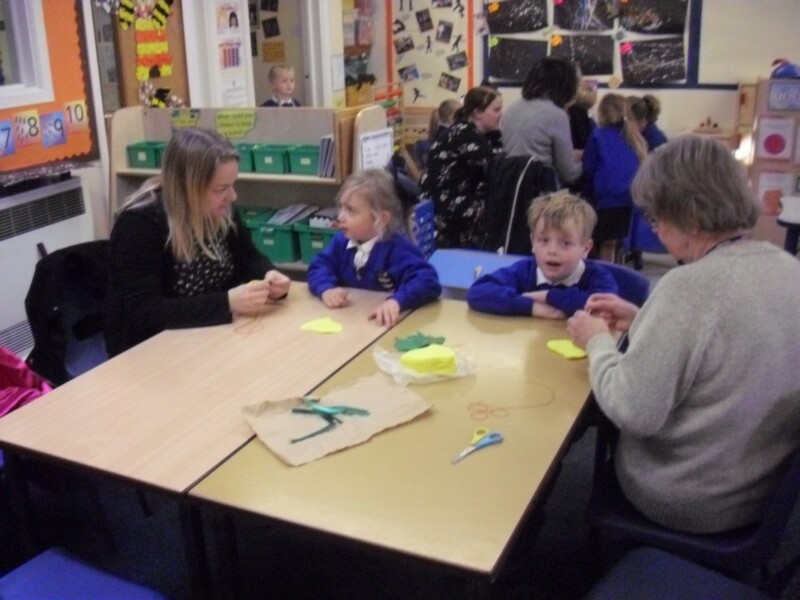 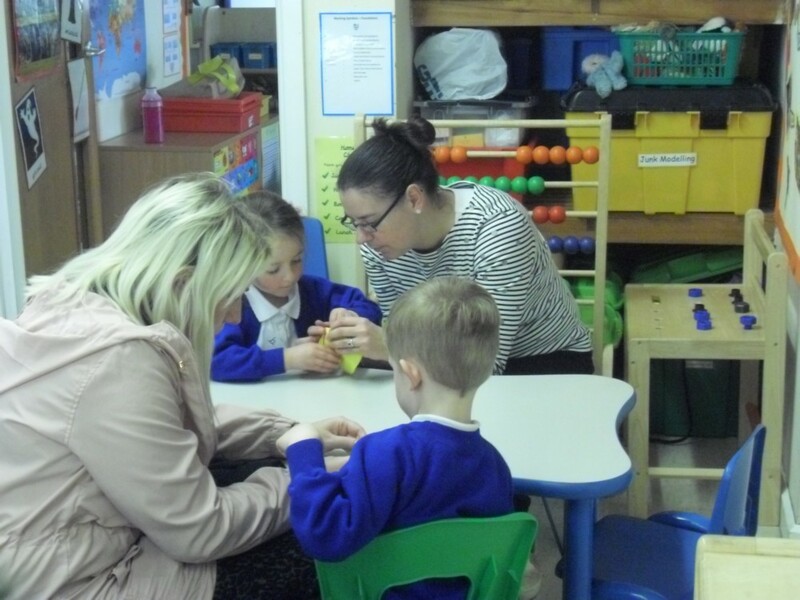 This term, the Sunflowers are exploring Peruvian weaving with Mrs. Bennett. 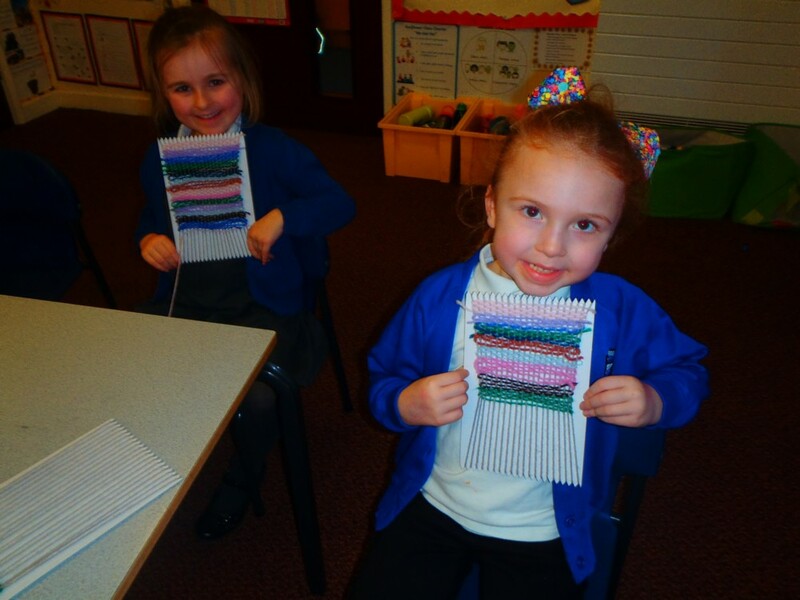 They have found out how to use a loom and create their own patterns with wool. 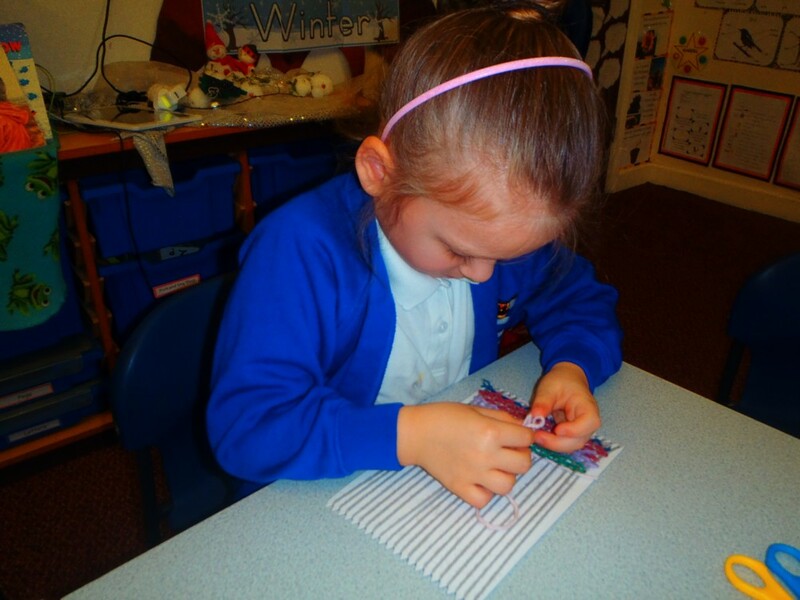 EW- I am enjoying weaving and have got the hang of it. 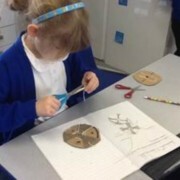 JS- I like the patterns I've made. 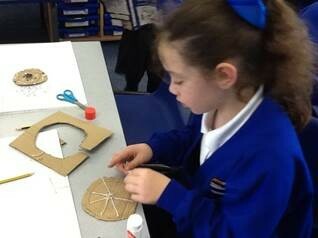 OB- Once Mrs. Bennett showed me how to do it, I could do lots of weaving on my own. 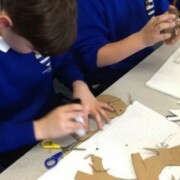 PR- You have to weave the wool in and out. 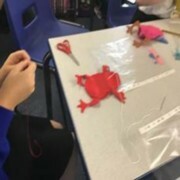 Mrs. Brady would like to thank Mrs. Bennett for preparing the looms and for teaching the children this wonderful skill. 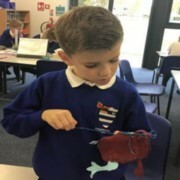 Sunflower Class have enjoyed sewing lots of lovely felt robins with Mrs. Warton. 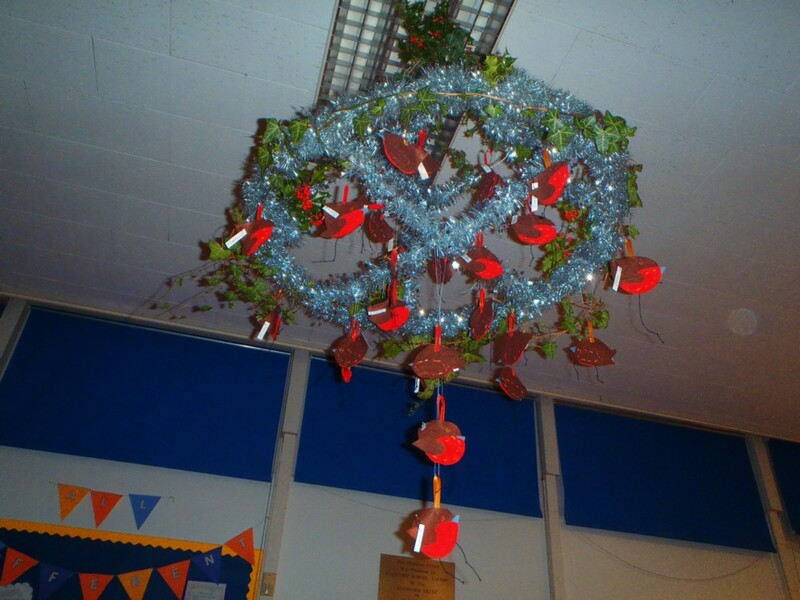 They look wonderful on our Christmas hoop. H- I liked sewing the red chest on. S- We had to glue a button eye on. 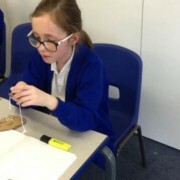 F- I liked sewing with Mrs. Warton, she showed me how to do it. 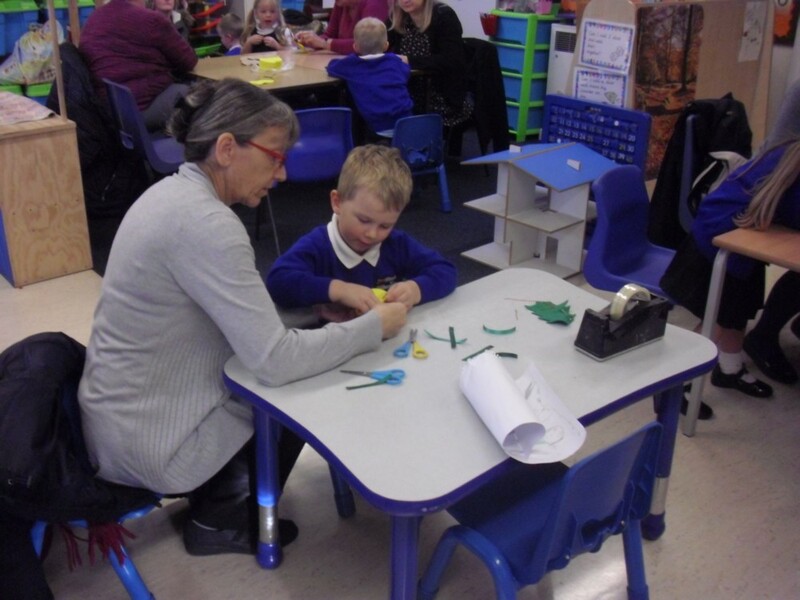 P- It was nice to spend some time with Mrs. Warton. 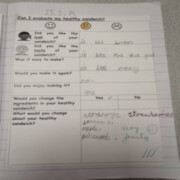 She really helped me. 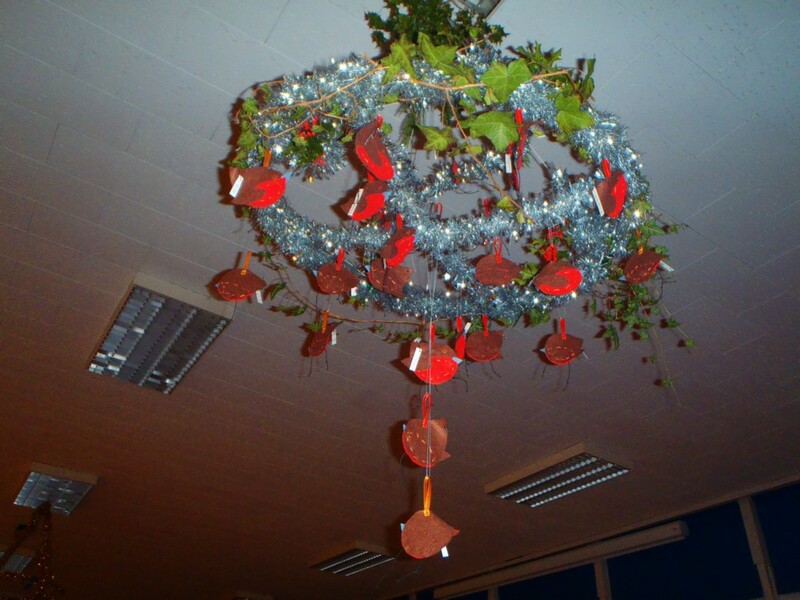 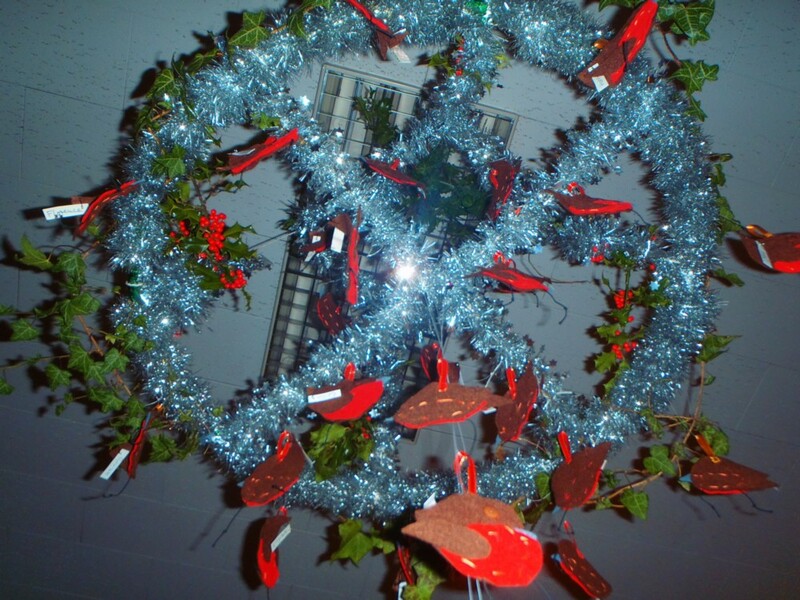 J- We created a pretty decoration for the hall, for everyone to see. L- We need to thank Mrs. Warton for sewing with us and we should thank Mrs. Drury too for putting all the robins on our hoop for us. 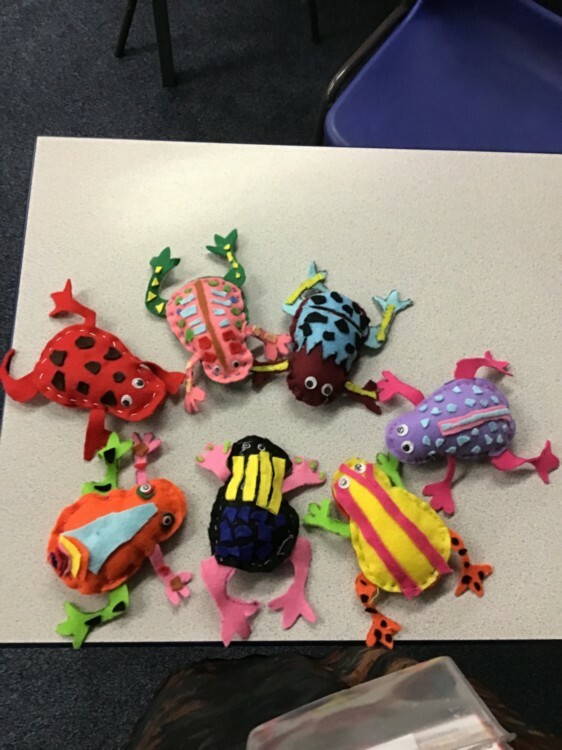 We have now finished our Poison Dart Frogs ready to sell as a part of our enterprise project. 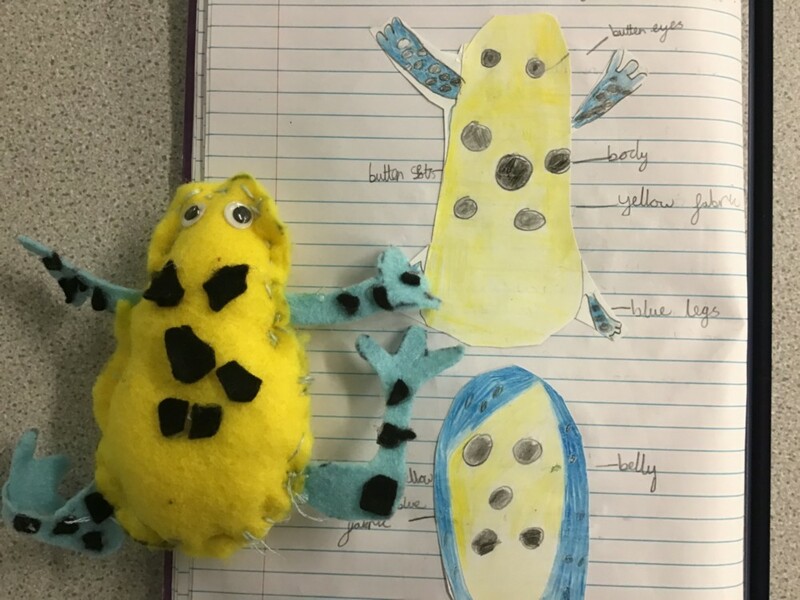 We compared our designs to our completed frogs. 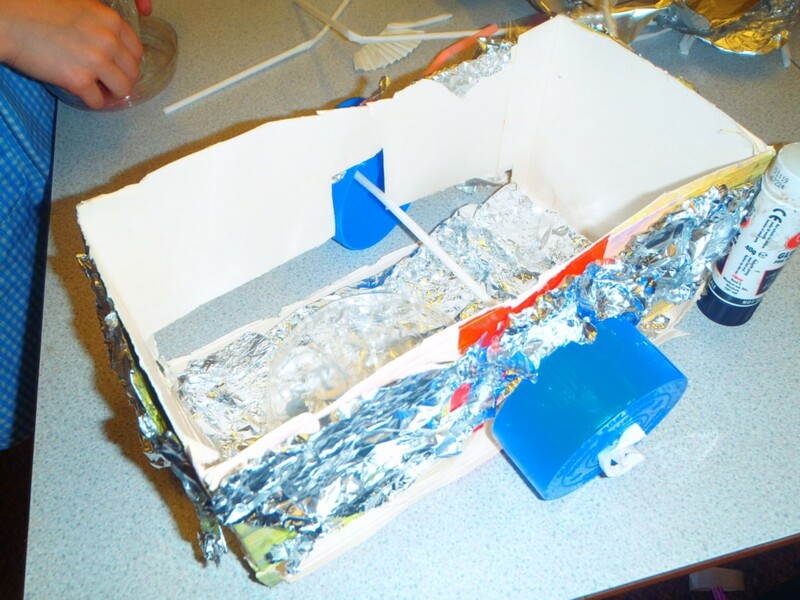 We considered the challenges we faced when making this product and how we overcame them. 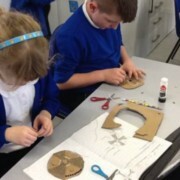 We thought about the changes we would make if we did this project again. 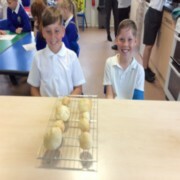 Next step marketing our finished products ready to sell! 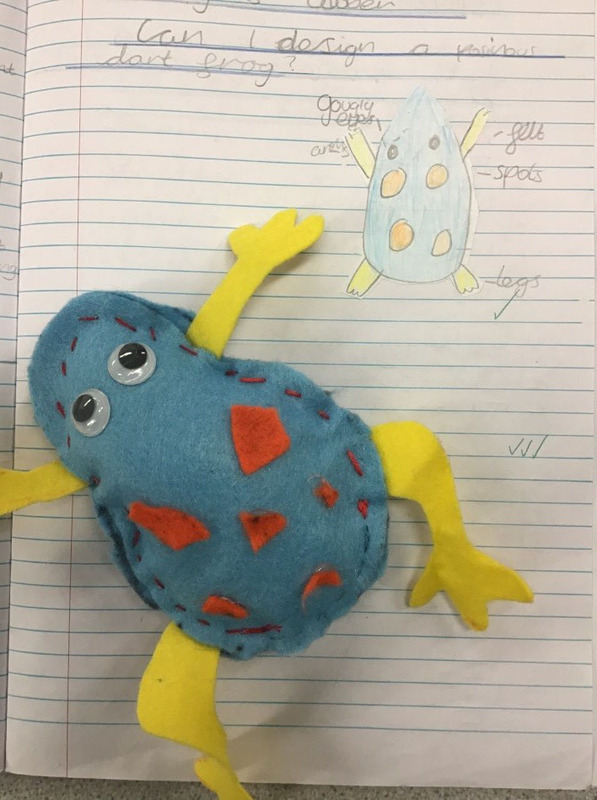 We have been very busy this week beginning to sew our dart frogs that we have designed. 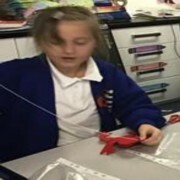 LQ: Can I join materials together and handle tools safely to create a bell decoration? 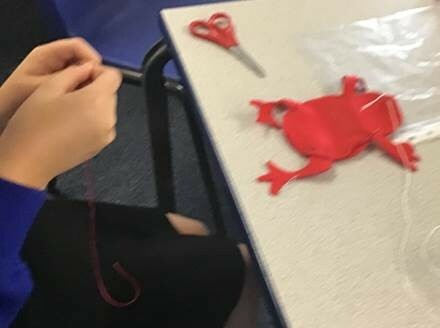 Today we have been very busy with our needle and thread sewing bell decorations for our enterprise craft sale. 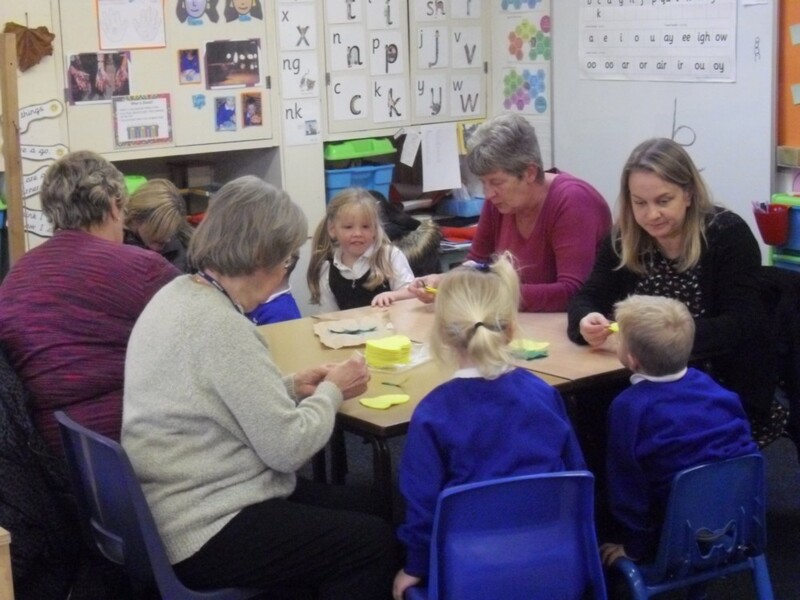 We were delighted to welcome lots of mums, grandmas and aunties for the afternoon’s activity. 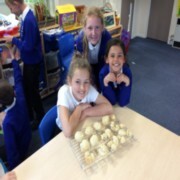 A very big ‘thank you’ for all your help. 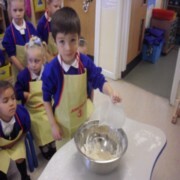 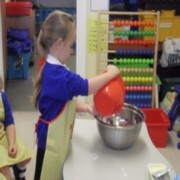 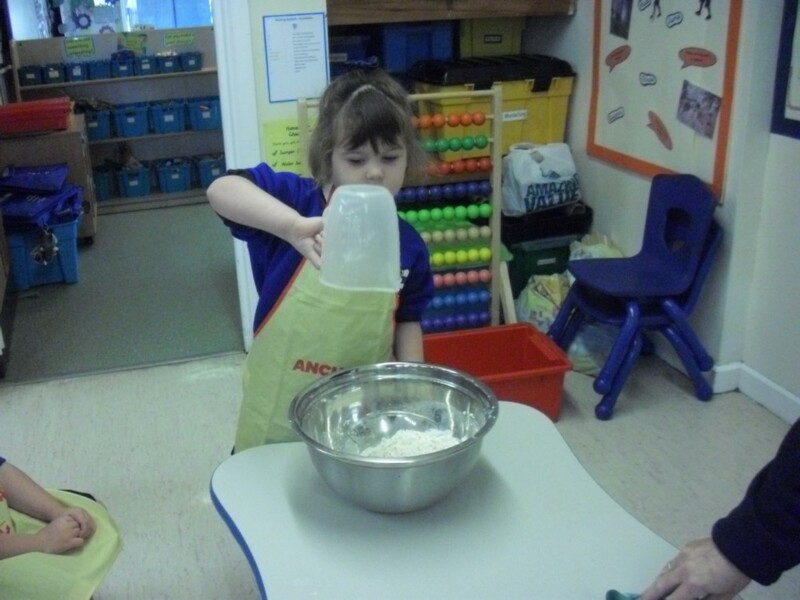 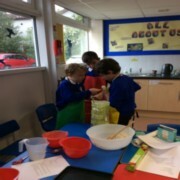 Following the story 'The Little Red Hen' and in preparation for our Harvest Festival we were inspired to make some bread. 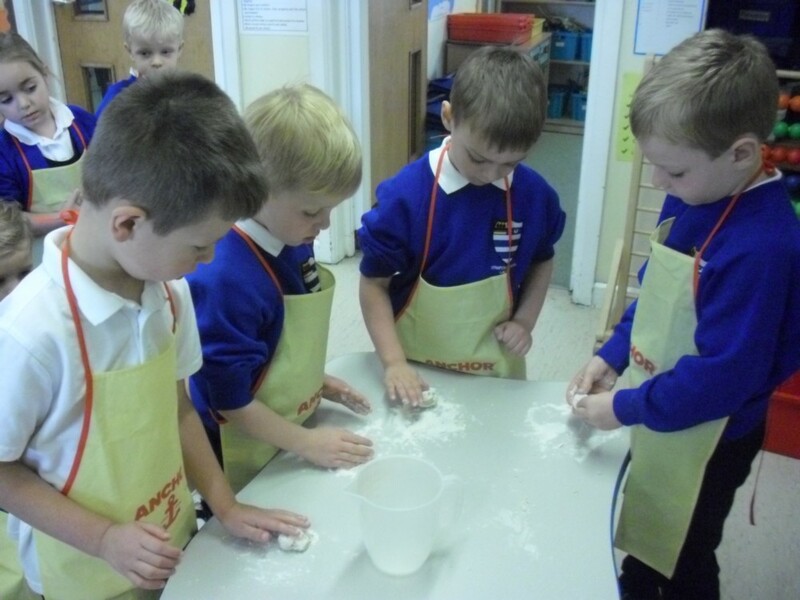 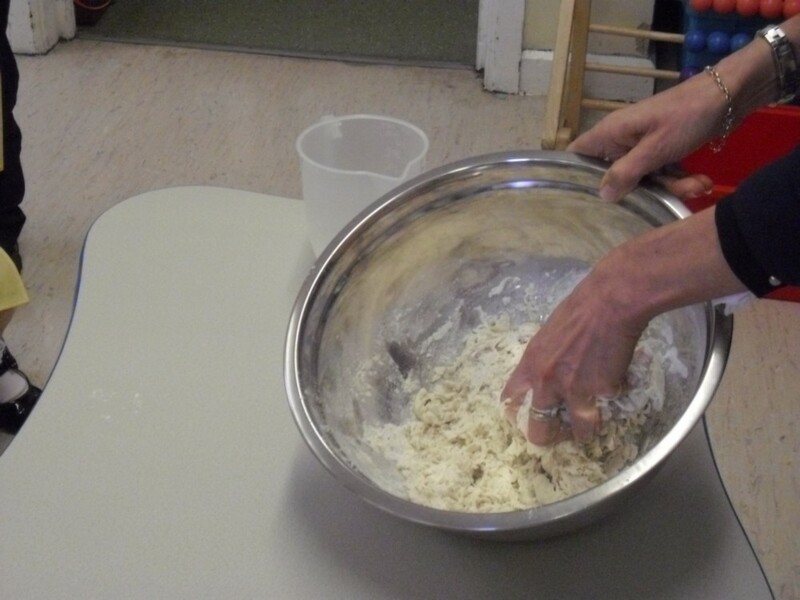 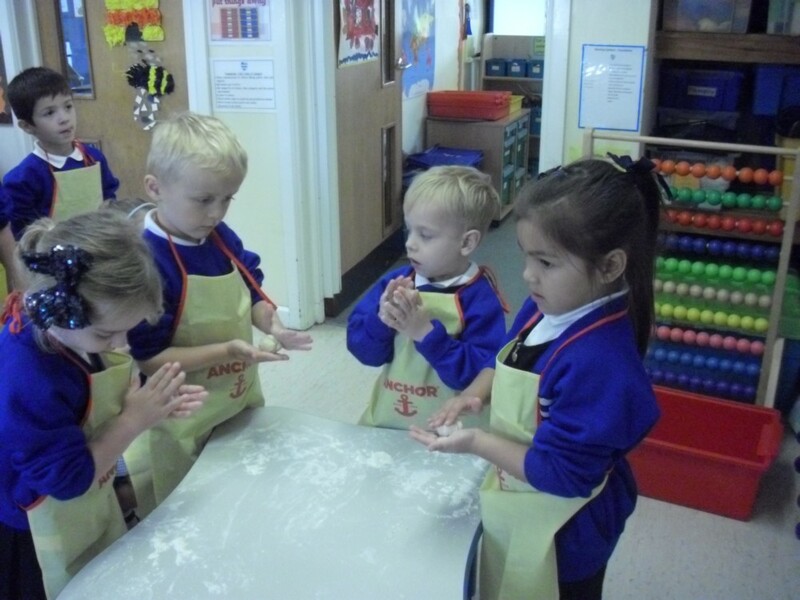 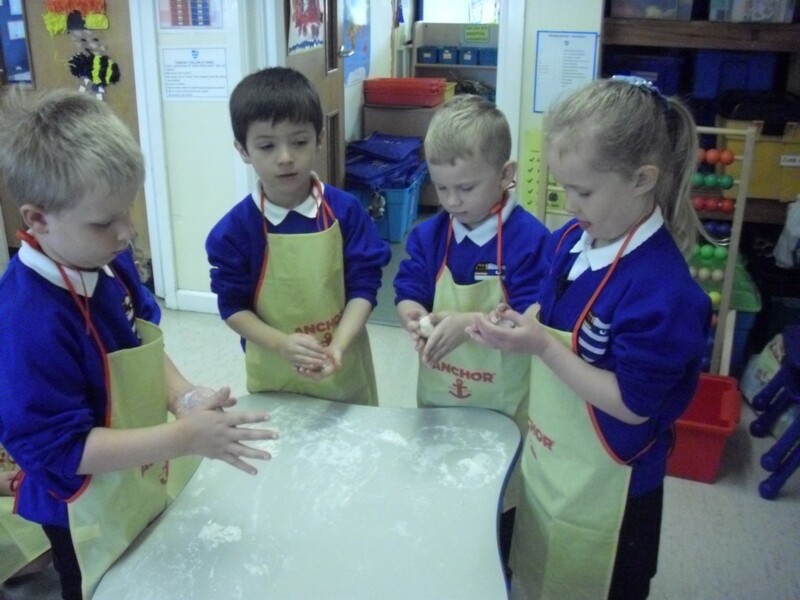 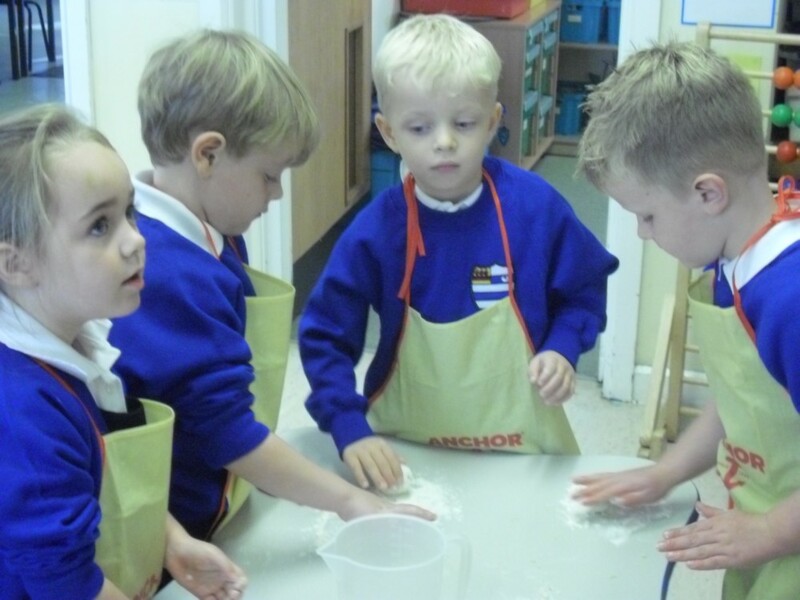 Our hands and fingers were very busy kneading and rolling the dough. 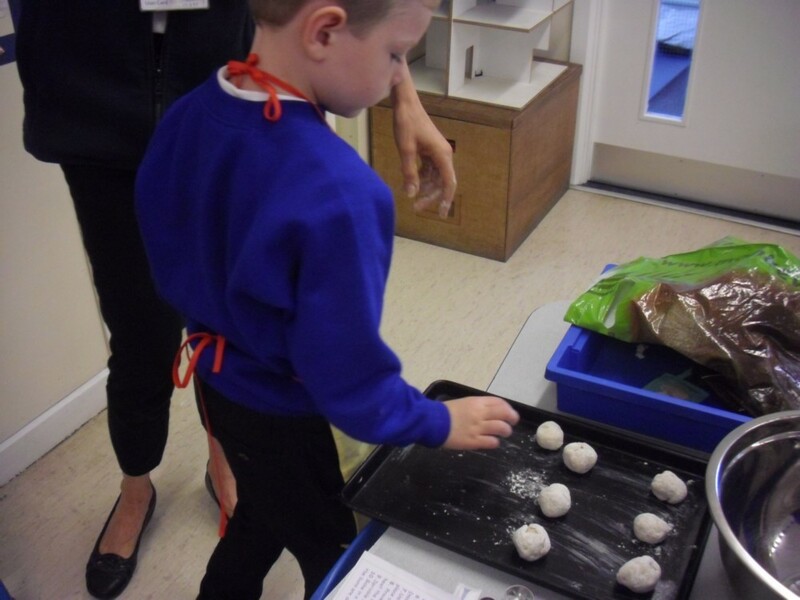 We looked at the ingredients needed and thought of lots of words to describe the dough including ‘squidgy’, ‘soft’ and ‘stretchy’ and how the bread changed once cooked. Of course the best bit was eating our fresh bread and enjoying the delicious smell! 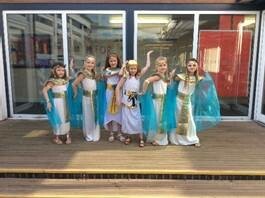 Poppy class has a wonderful morning launching our learning about the Ancient Egyptians. 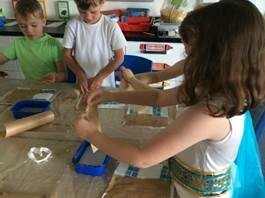 First the children learnt about how the Egyptians were the first civilisation to start writing on a form of paper called papyrus. We tried making our own version of this. It was very messy! 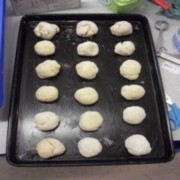 Keep looking out on the blog for these as we have great plans for them once they are dry. The Egyptians liked to look good and most of the wealthy people wore necklaces as they were a status symbol. 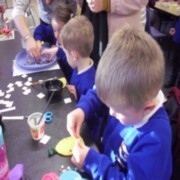 They liked them to be made of gold with lots of bright colours and beads on them. 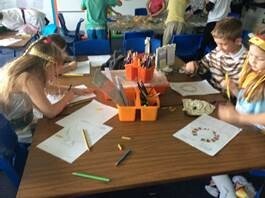 The children started to design their own necklaces which we will be making shortly, so keep checking the blog to see the finished results. 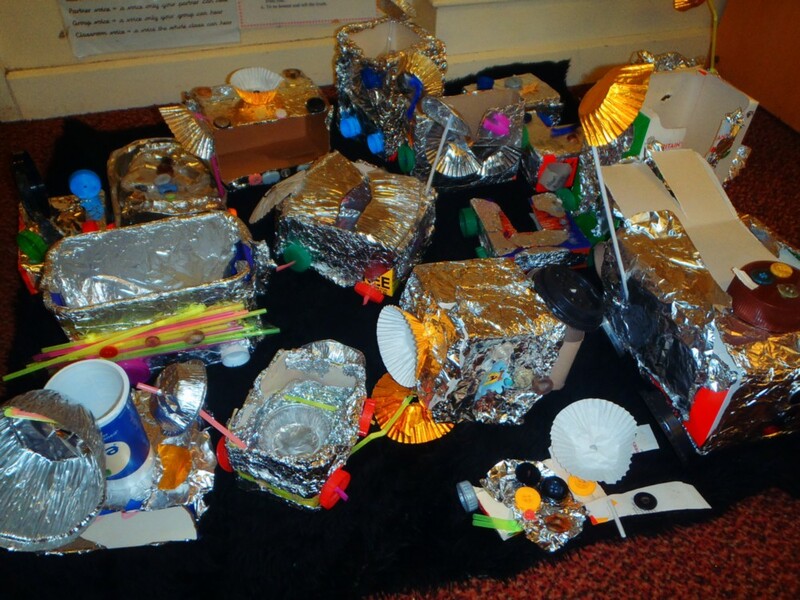 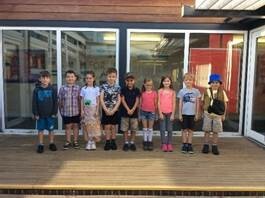 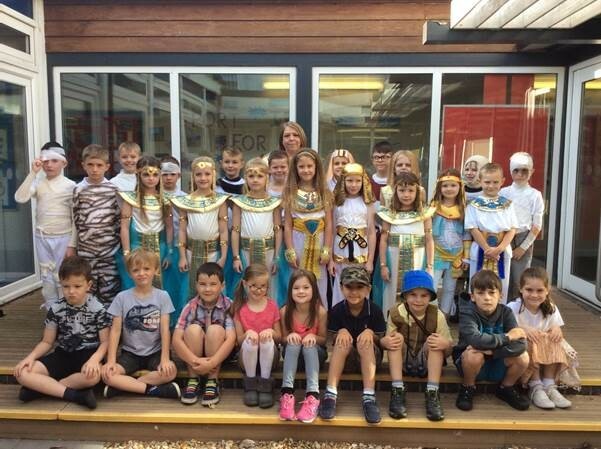 The children looked fantastic dressed as Egyptians, Mummies and Explorers. 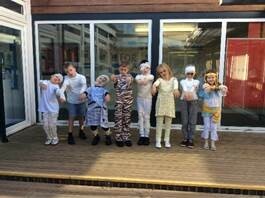 Thank you for all the effort you put into making the children look so fabulous! 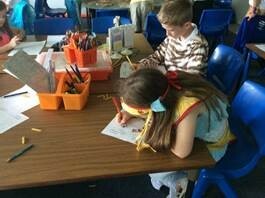 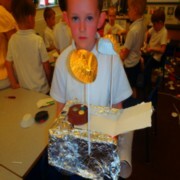 Sunflower class enjoyed learning all about Neil Armstrong in their History lessons. 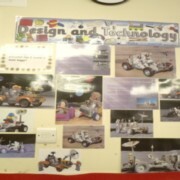 They thought it must be really exciting to land on the moon and explore the moon's surface. 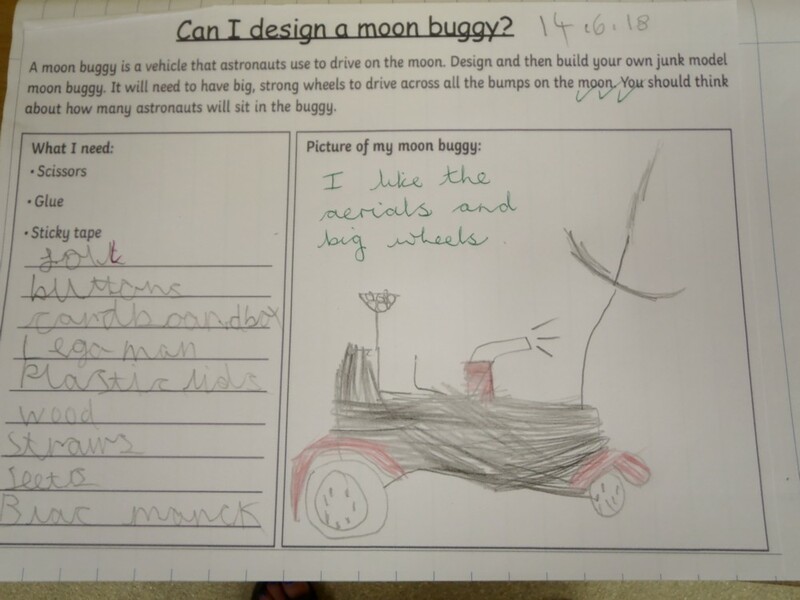 So they decided to design and make their own moon buggies. 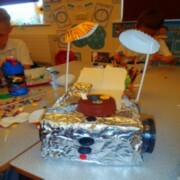 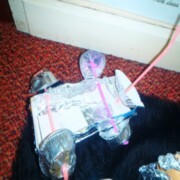 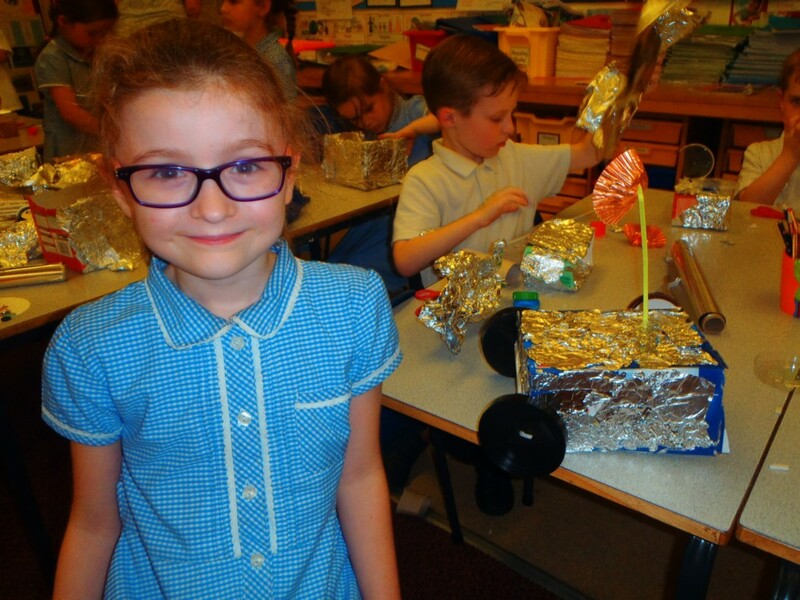 Harvey- I put control buttons on my moon buggy. Jack- I put a big tall aerial on my buggy and a seat inside for one astronaut. 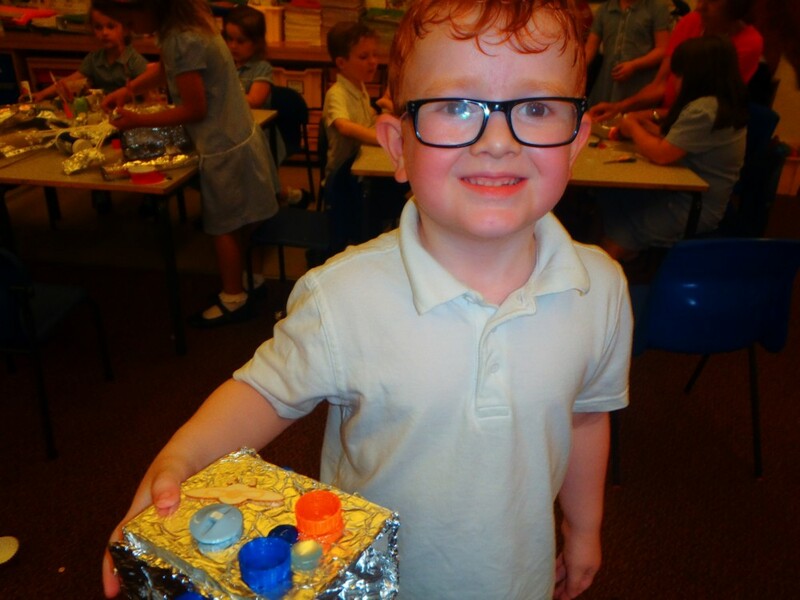 James- I really liked making this because it was fun to use different materials. 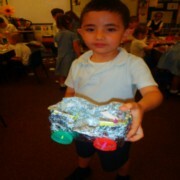 Lucas- I had to glue my wheels on with PVA strong glue. 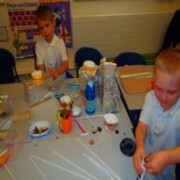 Jamie- I made my wheels move, by putting a hole in the middle and fixing a straw through them." Our Design and Technology work this term is all about researching, designing, baking and evaluating different breads. 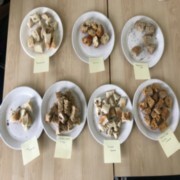 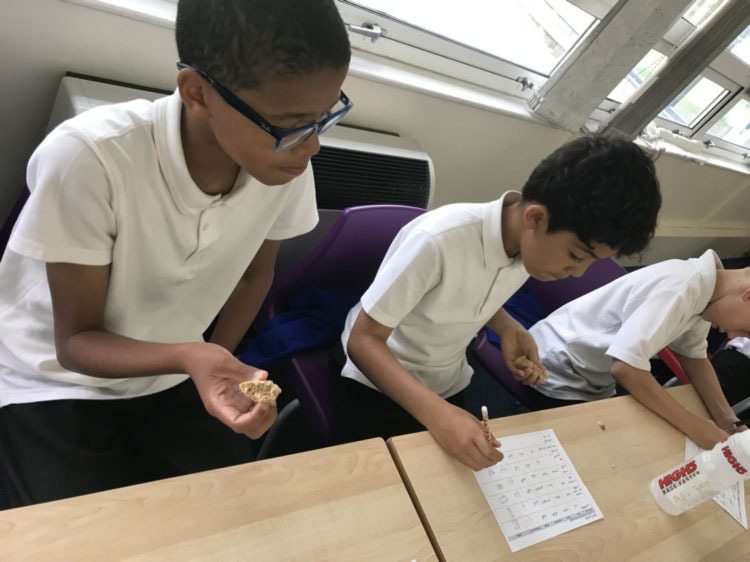 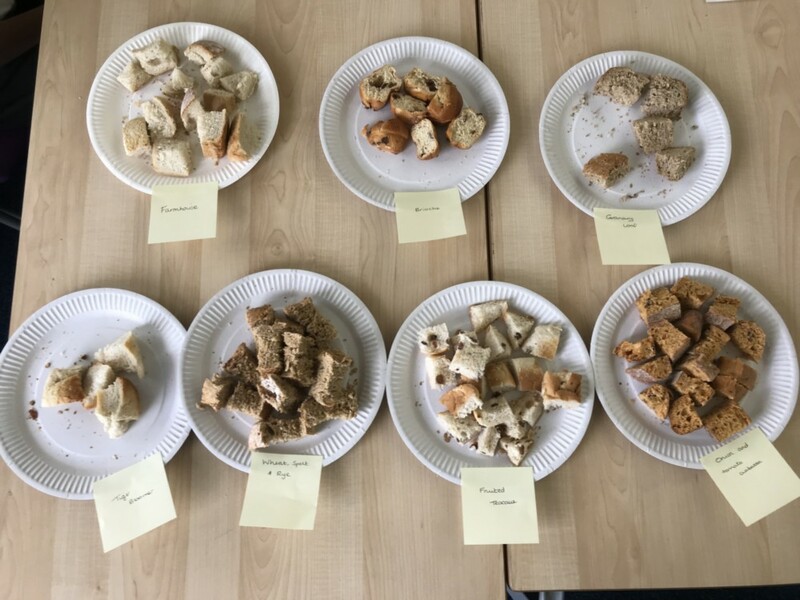 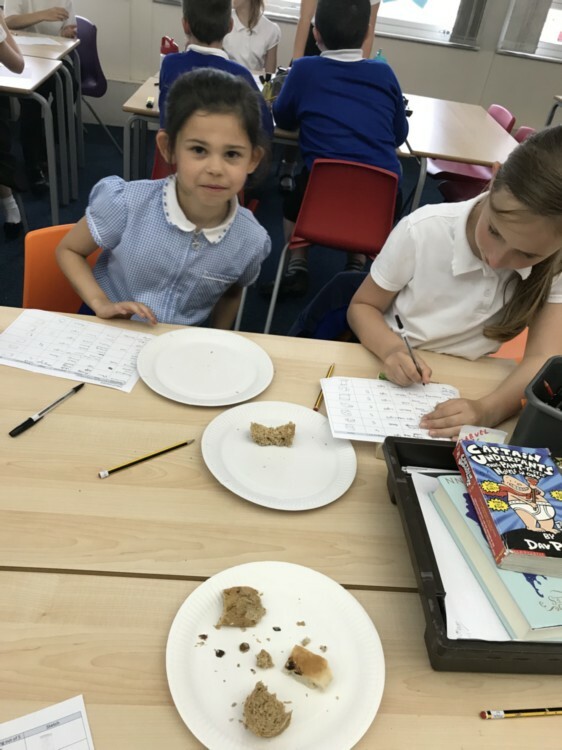 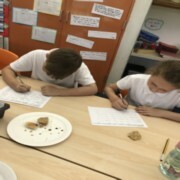 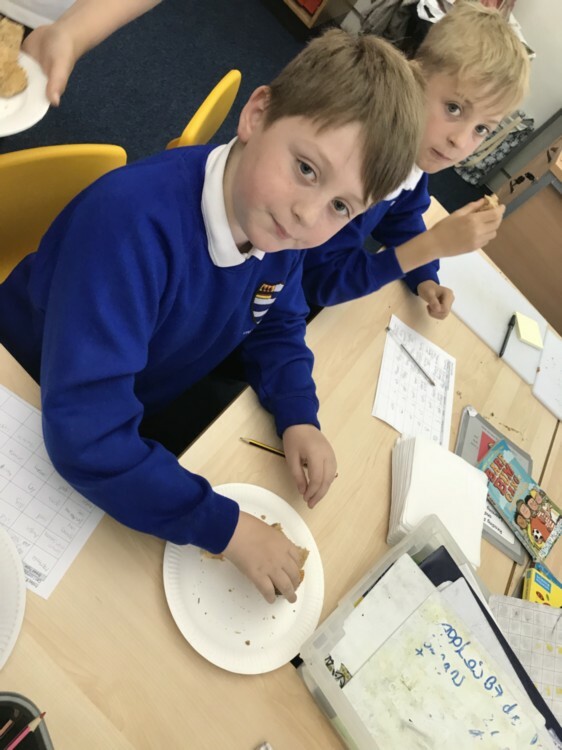 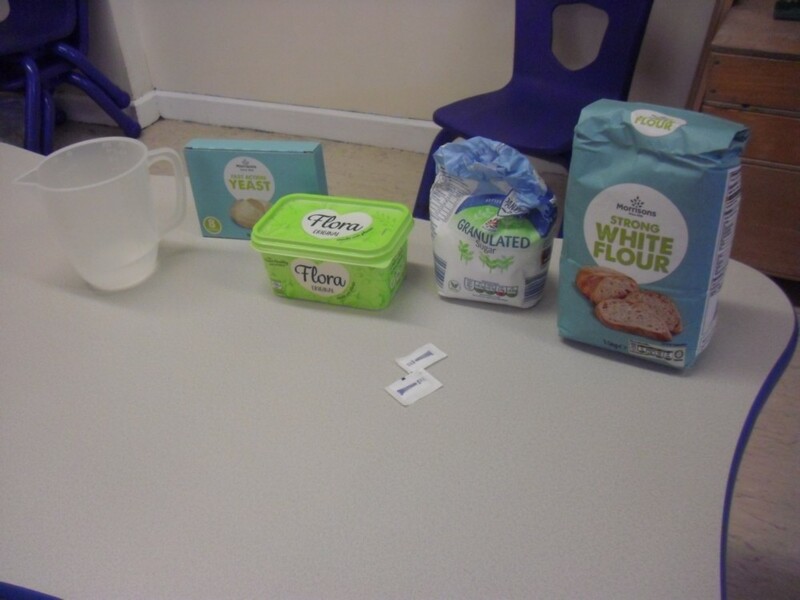 As an introduction to this topic we decided to taste different breads to inspire us with choosing different flavours, textures and types of bread we could bake. 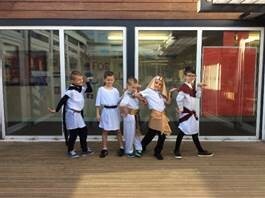 Some were certainly more popular than others! 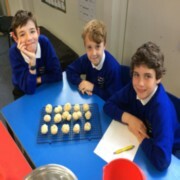 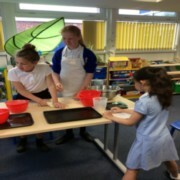 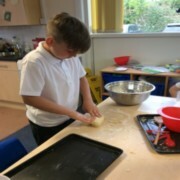 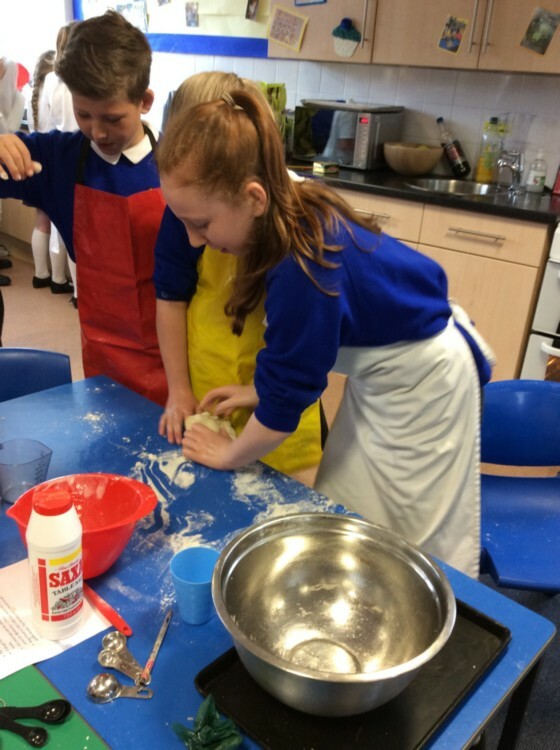 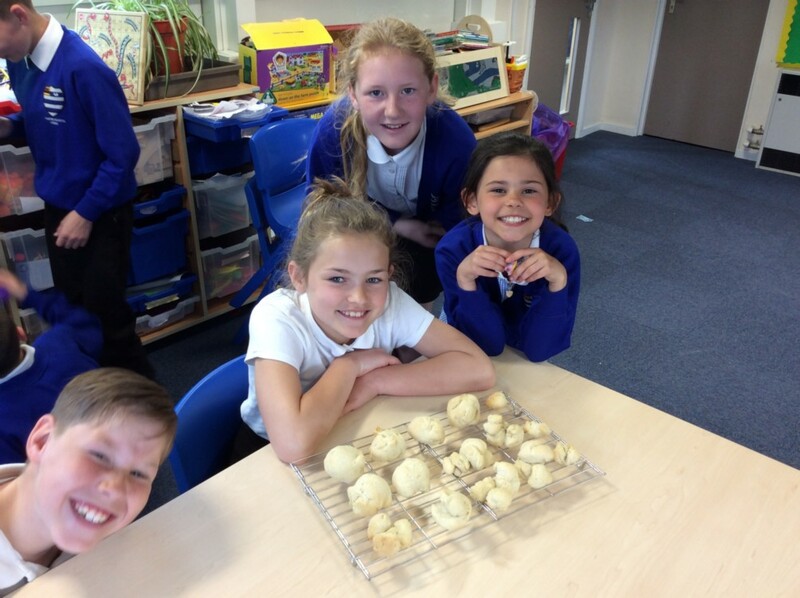 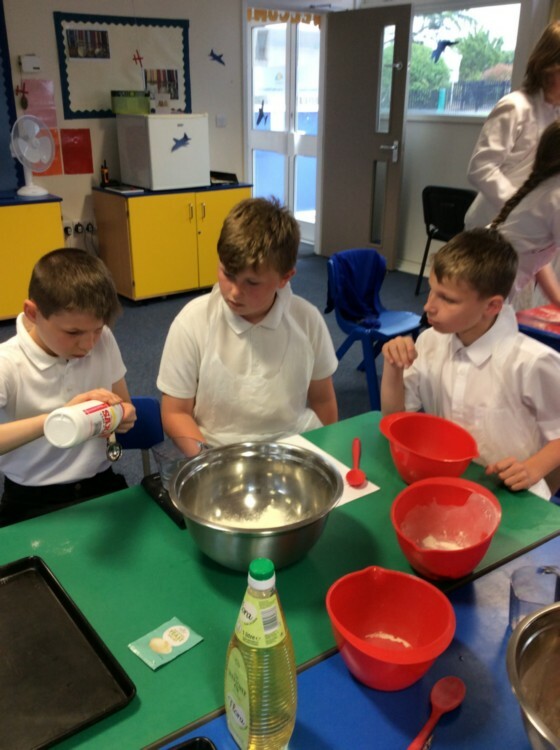 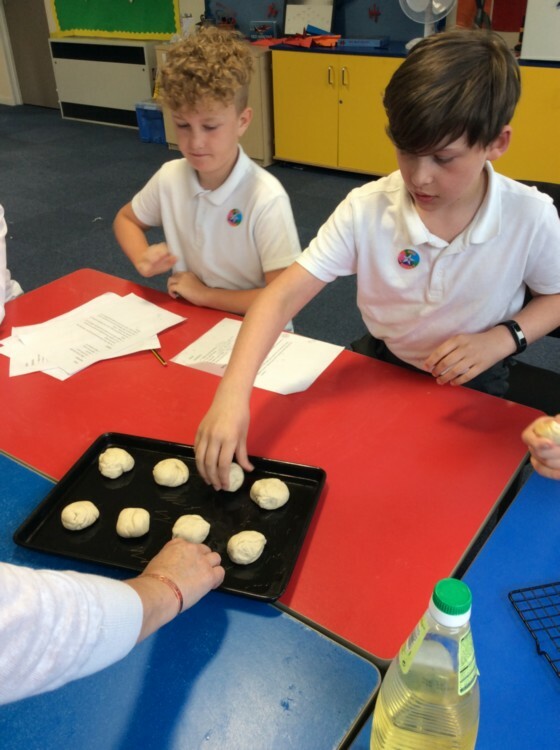 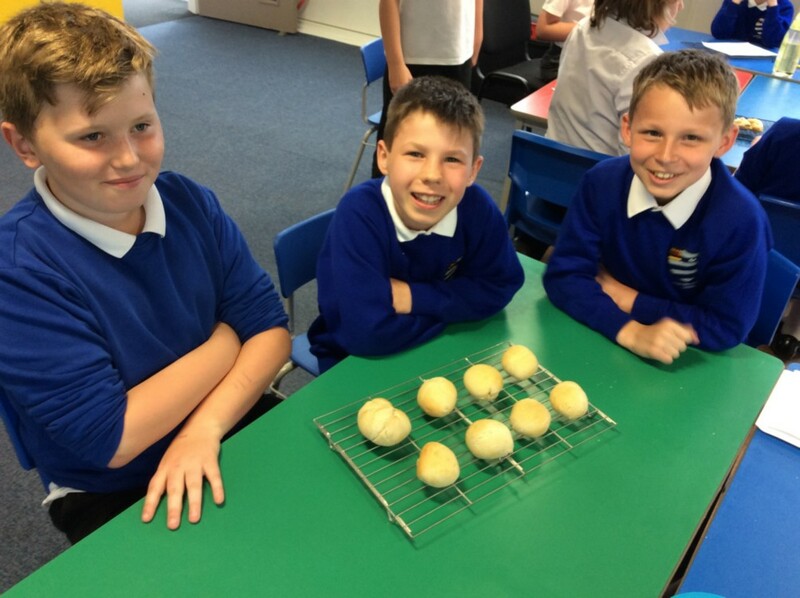 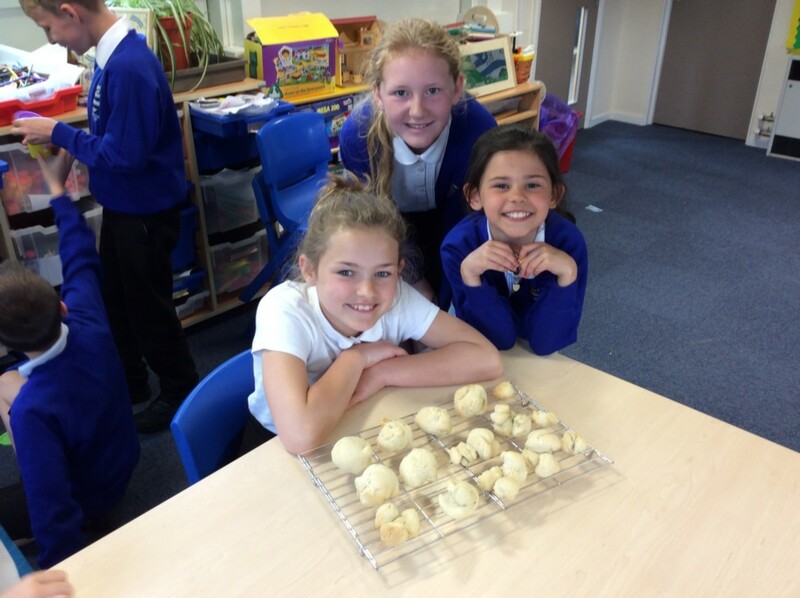 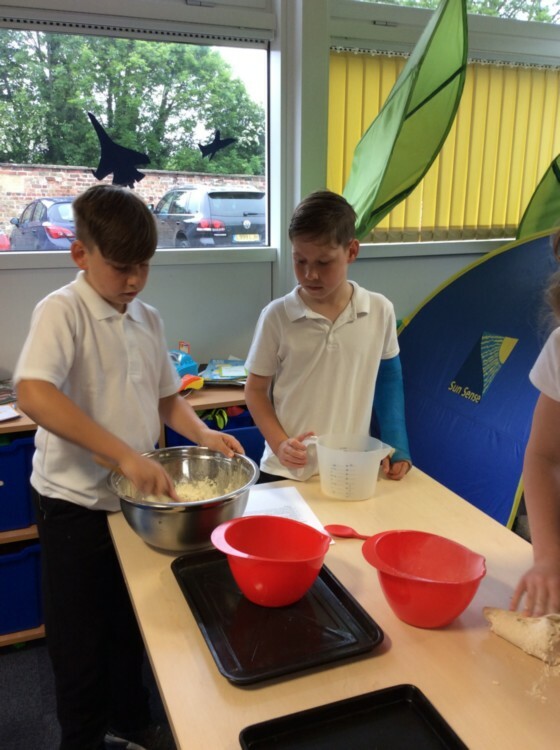 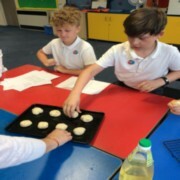 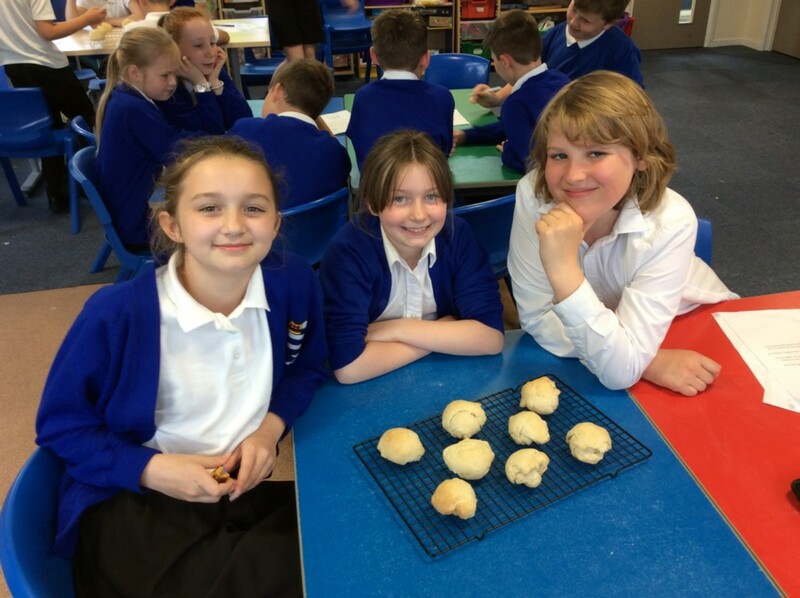 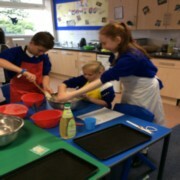 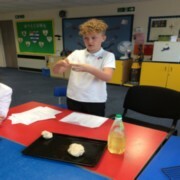 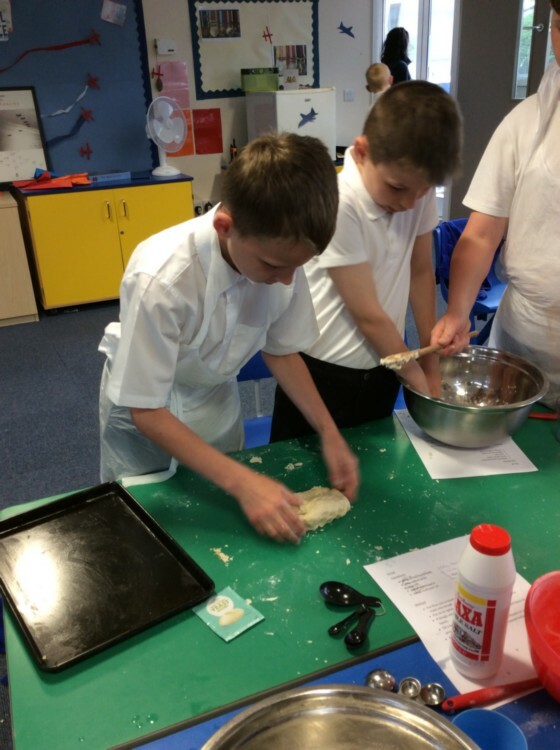 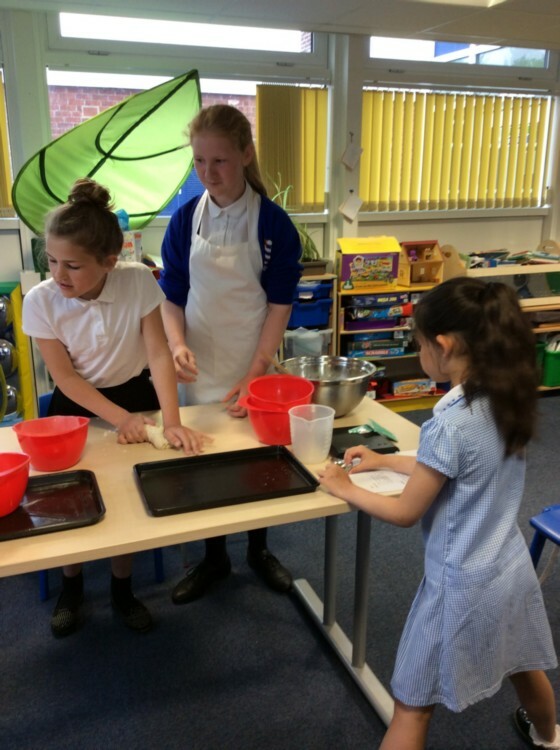 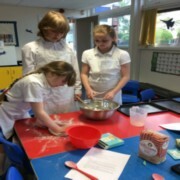 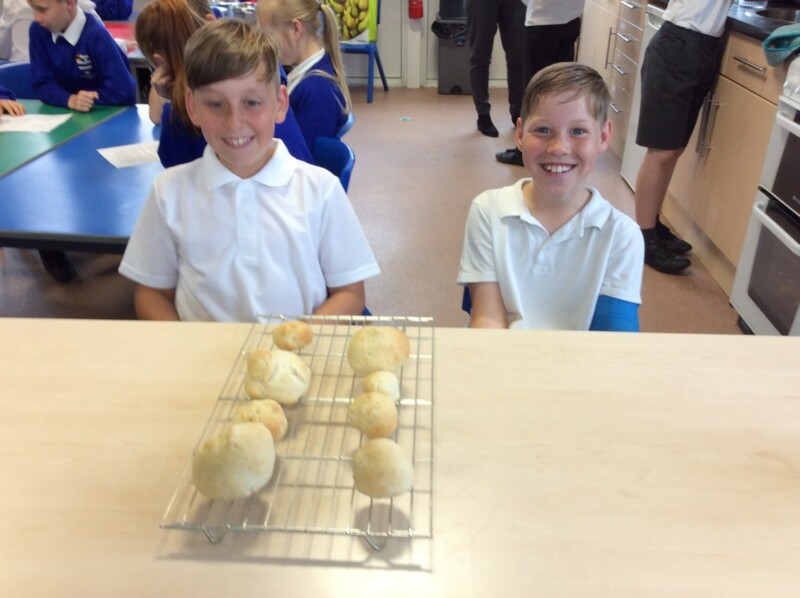 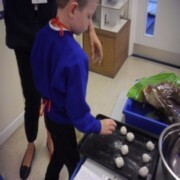 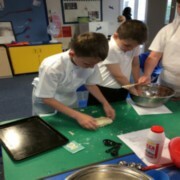 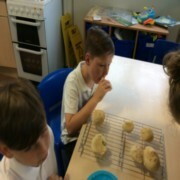 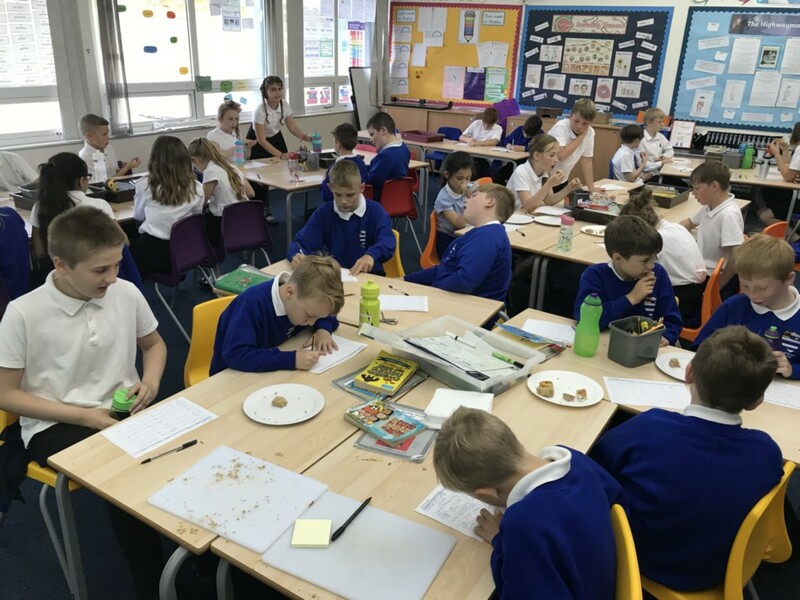 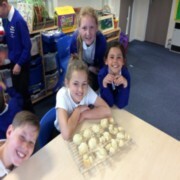 Pupils in Year 5 and Year 6 worked together to create delicious bread buns. 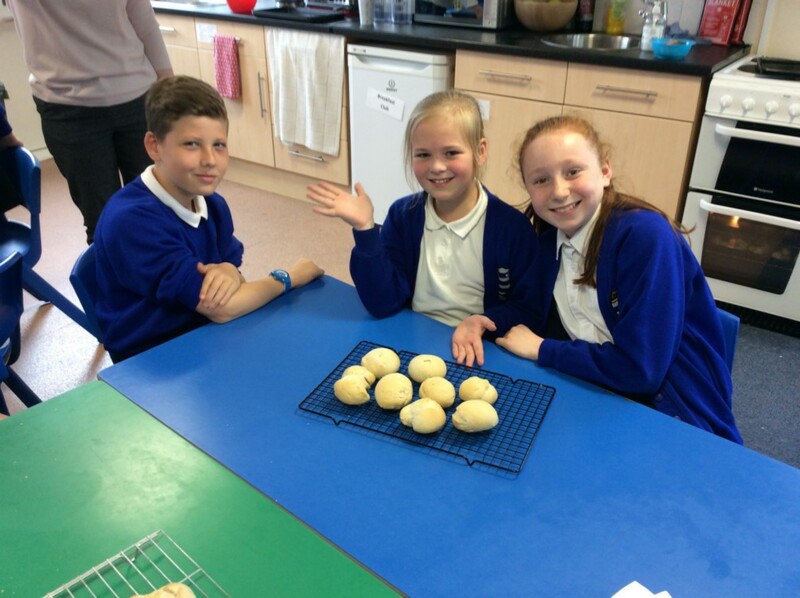 We have perfected the basic bread recipe and will now research and experiment different ingredients to add. We certainly enjoyed eating our bread and Charlie was relieved to see we were eating it with 'proper' butter! 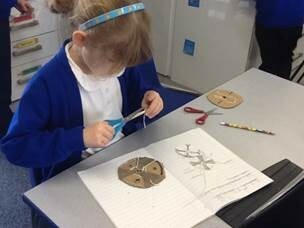 This afternoon we used our designs to make an Anglo-Saxon broach using a variety of materials. Afterwards we evaluated the process.